Connecticut Legal Services Deputy Director Josh Perry answers questions with Yale Law intern Hannah Shoen. A federal judge ordered the government to bring the parents of two immigrant children currently being held in Connecticut to a court hearing in Bridgeport next week, after finding that their separation at the U.S. border was unconstitutional. U.S. District Court Judge Victor A. Bolden ruled Friday that the separation violates the children’s due process rights. His decision came two days after the initial hearing on the case. The children’s parents watched those proceedings via teleconference from a detention facility in Texas, but the youth were not present. 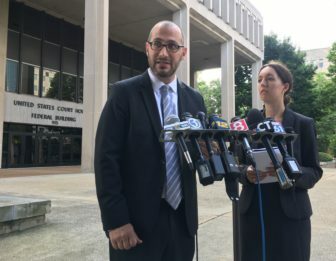 Attorneys at Connecticut Legal Services and the Worker and Immigrant Rights Advocacy Clinic at Yale Law School filed the federal lawsuits on behalf of a nine-year-old Honduran boy identified as J.S.R and a 14-year-old Salvadoran girl referred to as V.F.B. Connecticut Legal Services Deputy Director Josh Perry said the question now becomes how quickly the children will be released and safely reunited with their parents in the community. “This fight isn’t over, and it won’t be over until they are reunited at liberty with their parents,” Perry said in a statement on Saturday. Assistant U.S. Attorney Michelle McConaghy did not immediately respond to a request for comment Saturday. Dr. Andres Martin, director of the psychiatric unit at Yale New Haven Children’s Hospital, testified on Wednesday that he and other doctors diagnosed the two children with “full blown acute PTSD.” Martin said their symptoms include difficulty sleeping, depression, anxiety, and a lack of hope. Bolden ordered the government to bring the children’s parents to Connecticut for a July 18 status conference, and provide daily video conferencing between the children and their parents in the intervening days. The judge also ordered each party in the case to present a plan during the July 18 meeting to address the children’s trauma. “Judge Bolden’s ruling acknowledges the deep harm that the government inflicted on V.F.B. and J.S.R. by forcibly separating them from their parents,” said Hannah Schoen, an intern with the Worker and Immigrant Rights Advocacy Clinic at Yale Law School. The order comes on the heels of an acknowledgment that more than 2,000 children have been separated from their parents by immigration officials at the border this spring. The Trump administration later reversed its “zero tolerance” immigration policy amid widespread backlash. In the Connecticut case, the complaint states J.S.R. and his father were detained together at the border in June before the boy was separated from his father while he was sleeping. Dozens of doctors are volunteering on the U.S.-Mexico border as the flow of migrants crossing without papers and asking for asylum climbs to a six-year high. WASHINGTON – As it was the last time the federal government closed, protection for young immigrants known as “Dreamers” has been raised as a possible bargaining chip in a deal to end the partial shutdown. But as Democrats and Republicans alike panned a large-scale immigration deal for President Trump’s wall as the solution to a shutdown, it appears an elusive solution. NEW LONDON - U.S. Sen. Richard Blumenthal pledged Monday to introduce legislation to restore wages for all U.S. Coast Guard personnel, about 43,000 individuals whose pay will be suspended Tuesday as part of the ongoing federal shutdown. The Trump administration is pressuring Vietnam to uphold a 2008 agreement and take back refugees who came to the United States before 1995. Many Vietnamese who came to the United States before 1995, some of them fleeing the Vietnam War, have lived in a gray area of immigration law. If they had a criminal record, they could not attain legal status, but they could not be deported either.